China unveiled its first "Very Large Floating Platform" project which appears to be a 21st century iteration of the US Military "Mobile Offshore Base" concept. The project was unveiled to the public during the "National Defense Science and Technology Achievements" exhibition held recently in Beijing. It is reported that the very large floating structures (VLFS) is thousands of meters long and made up of floating modules connected together. It can be assembled as required and used as a floating pier, logistics base and airport. A large floating island or airport or sea base can be achieved by linking a several floating platforms, which is very valuable for military and civilian use, said an expert when interviewed by Shenzhen TV. The mobile offshore base (MOB) idea was first seriously considered when the United States entered Operation Desert Shield (1990–91). MOB is a concept for supporting military operations where conventional land bases are not available. With the MOB concept the U.S. could have a base anywhere in the world in as little as a month. A MOB could accomodate and deploy conventional fighters and even large carge aircraft like the C-17 Globemaster III as well as landing craft. 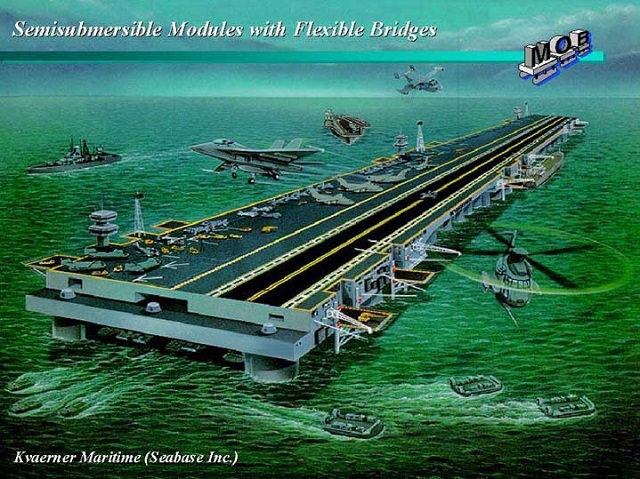 Such a floating offshore base has been researched and proposed, but never developed. Future will tell if unlike the U.S., the Chinese military decides to go ahead, develop and actually produce a VLFS/mobile offshore base.